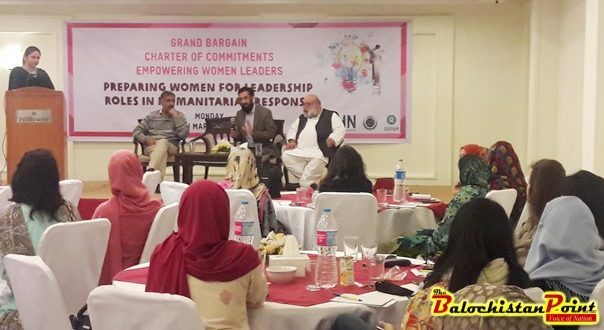 Islamabad: Oxfam in Pakistan in collaboration with the National Humanitarian Forum (NHN) and National Disaster Management Authority (NDMA) launched a series of first response trainings exclusively for women humanitarian workers to take leadership roles in humanitarian efforts. “Preparing Women for Leadership roles in Humanitarian Response,” is a unique Oxfam initiative, to train female mid-management professionals from National/Local NGOs and Local Government departments in disaster response preparedness across Pakistan. The launch was held at the Hill View Hotel and 30 female humanitarian responders will be participating in the week-long trainings. The launch also marked Oxfam’s part in the Grand Bargain: an agreement between more than 30 of the biggest donors and aid providers, which aims to get more means into the hands of people in need. It is essentially a ‘Grand Bargain on efficiency’ between donors and humanitarian organizations to improve the effectiveness and efficiency of humanitarian action. Women bring vital skills, resources and experience to humanitarian response. They are among the first responders to a crisis, taking risks and playing critical roles in the survival of families and communities. Women are often responsible for the care and emotional rebuilding of communities in the aftermath of a crisis and they often have strong local knowledge and links with others in the area where they live, which is a critical resource during humanitarian response. Oxfam aims to increase women’s access to resources and work with women humanitarian workers from national and local NGOs as well as local government departments to promote protection in disasters, including providing safe spaces for women. Safe, inclusive spaces that foster women’s leadership, agency, and collective capacity to challenge violence and abuse in times of crisis. Oxfam intends to bring about long term change in transforming gender relations in communities. By opening the space for women’s leadership alongside men, this contributes to women’s empowerment and the transformation of women’s positions in households and communities.